The Minnesota Distributed Autonomous Robotic Team, MinDART, as pictured below, represents current research in cooperative mobile robotics being carried out at the University of Minnesota. We are interested in determining how to use multiple robots to efficiently solve problems. 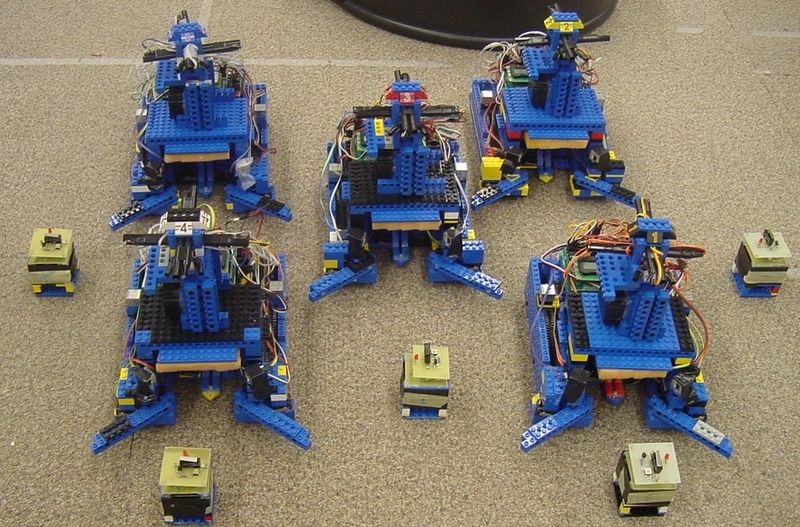 The robots are constructed from LEGO Technic blocks. LEGOs are used because they are lightweight, strong, easy to work with, and are ideal for rapid prototyping and proof-of-concept designs. 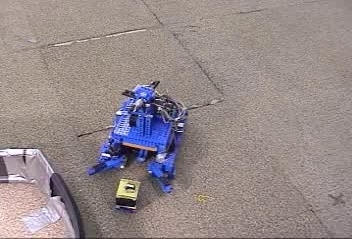 The University of Minnesota AIRVL has successfully been making use of LEGOs as a robot fabrication material for several years. We present a task of search and retrieval whereby robots locate, collect, and return targets to a home base. Robots are homogeneous and perform independently with a localized goal of target retrieval without the aid of communication. The task is a simplified version of mine-field clearing where mines are localized using close-proximity sensors such as magnetometers, or of a find-and-rescue task where robots find and retrieve specific targets such as those dropped by air. All robots have the same hardware and software, but work independently. In our previous work, the robots were not capable of any kind of communication. RF data links are being developed for these robots which will give them the ability to communicate information with each other. 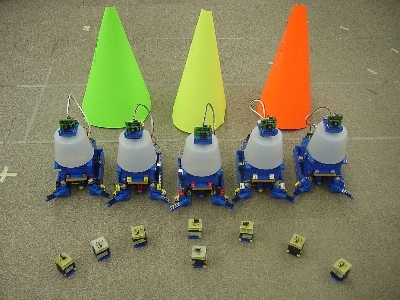 The robots have the ability to localize themselves within the environment using a system of three light-bulb landmarks. We have studied the effects of the number of robots used to complete a task, the distribution of targets, and the size and complexity of the environment in which the robots work. We have also compared the effectiveness of a completely reactive search strategy with a more directed search strategy which uses the robot's localization abilities. These results are presented in the IAS-7 paper listed in the resources section. 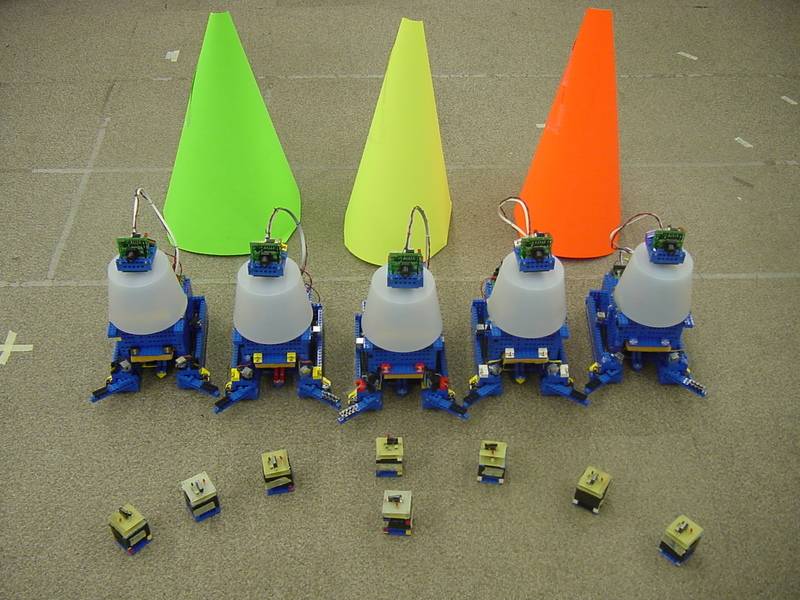 More recently, we have studied the effects of simple communication on the performance of the robots. We have replaced the photoresistors and lightbulb landmarks for CMUCams and colored landmarks. We have also added a signaling beacon to the robots that allows them to detect each other's presence. In our foraging experiments, the robots used their communication abilities to signal each other when they found a group of targets to pick up. Two different communication strategies were examined: reflexive and deliberative. In the reflexive strategy, the robots would activate their signal beacon whenever they were attempting to pick up a target. In the deliberative strategy, the robot would turn on its beacon (and stay motionless) when it was in the presence of a beacon that it could not pick up because it already had one in its gripper. We found that more complex control strategies did not necessarily improve task completion times, however they did reduce variance in performance measures. That is, while the robots weren't necessarily faster to complete the task, individual variances between runs were much smaller when communication was used rather than when it was not. In particular, there appeared to be a critical communication duration at which the robots would have the least amount of variance. If this time was lengthened or shortened, the performance variance increased. These experiments are documented in the technical report 03-011 listed in the resources section. The chassis features a dual-treaded design, which allows the robot to turn in place. 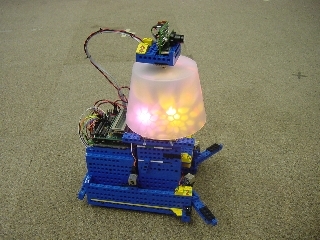 In the original design, a 100 watt light bulb is used as a "home base" landmark which the robots depart from initially and to which they return the target objects. To track the landmark, each robot has three cadmium-sulfide (CdS) photoresistors, mounted atop a turret which can turn 360 degrees. 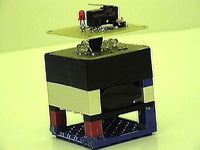 In the current design, the photoresistors have been replaced by a CMUCam which performs color segmentation and allows the robot to track a single colored target at a time. The light bulb landmarks have been replaced by colored cylinders and cones. 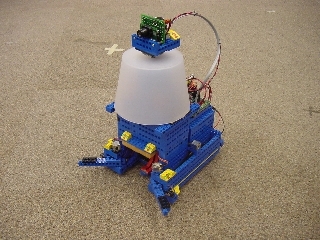 The robots have also been given a signaling beacon which they can use to let other robots "see" them with their CMUcams. 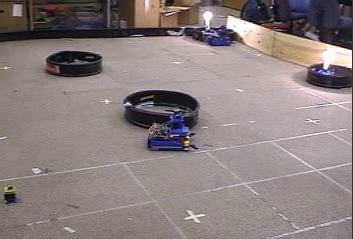 Each robot has three bumpers, the two in front also serve to guide the target into the robot's gripper. The onboard computer is a Handy Board programmed using Interactive-C. The targets are also made of LEGOs and small circuit boards. When activated, they transmit a constant stream of infrared light at a frequency of 40 Khz. The robots are, in turn, equipped with four IR sensors tuned to this frequency. 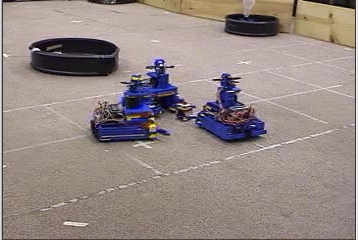 When the robot is close enough to a target, the robot slides a lifting mechanism into the target and picks it up. When a target is lifted from the ground, it stops all emissions until it is reset. In this way the robots are not distracted by targets that are being transported by other robots. 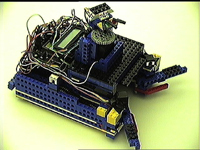 The robot is controlled by a finite state machine sequencer. The task is broken down into logical states, where each state consists of a set of behaviors running in parallel. Each behavior has a priority value so that actions that are more vital to the robot's mission take precedence. State 0 consists of the movements of the robot before a target is picked up. Its component behaviors include searching, seeking a target, avoiding obstacles and grabbing a target. 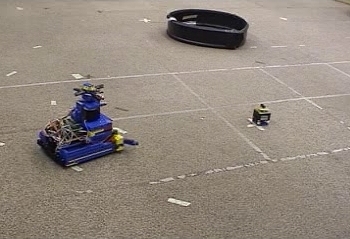 State 1 deals with the robot's behavior once a target is found, including going ``home'', avoiding obstacles and dropping the object. The robots' programming is completely reactive. They do not maintain any record or map of their environment. State 2 deals with picking up a target. The robots cannot resolve the exact position of the target due to the limited angular resolution of their IR sensors. As a result, they must use that information as well as their bumpers to determine the target's position and move themselves so they can grasp it. Web site by Chris Flowers-Huebner .